Of Wiarton, peacefully surrounded by her family, at Wiarton Hospital, on Thursday, December 5, 2013. 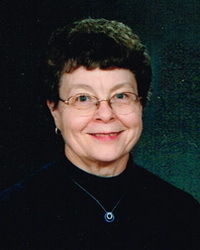 The former Carolyn Jean Pratt at the age of 65 years. Beloved wife and best friend of Rev. David Leggatt for over 41 years. Cherished mother of Brian Leggatt (Sonia), of Aurora, and Brenda Leggatt, of Owen Sound; and grandmother of Sydney Leggatt. Much loved sister-in-law of Linda Pratt, of London; niece of Audrey (Bob Putnam), of Lyons, and Wilma Baker (late Wilf), of Simcoe; cousin of Heather Johnson; and aunt of Tracey and Marcy. Sadly missed by her nieces, nephews and friends. Predeceased by her parents Maurice (1998) and Gladys (2013); brother Wayne Pratt (1999); and father–in-law and mother-in-law Charles and Doris Leggatt. Family invite friends to gather at St. Paul’s Presbyterian Church, 553 Gould St., Wiarton on Saturday, December 14, 2013 at 1 o’clock to celebrate Carolyn’s life, with visitation from 11 am – 1 pm prior to service time. Cremation has taken place. Donations to St. Paul’s Presbyterian Church, or the BPHS Foundation to support cancer care regionally and locally would be appreciated. Arrangements entrusted to the Thomas C. Whitcroft Funeral Home & Chapel, 814 Bruce Rd. 8, Sauble Beach (519) 422-0041.